Concerto No.20 in d minor K466 composed by Wolfgang Amadeus Mozart (1756-1791). Edited by Wolff / Zacharias. For 2 Pianos/4 hands. This edition: Urtext. 2-piano score. 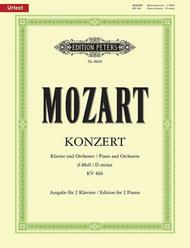 Published by Edition Peters (PE.P08820).2-Piano Score (with Beethoven cadenzas).